La bataille de’lYser/ The Battle of Yser, shot prior to 1918 (no exact data is known) is an important war document made by the SCAB (Service Cinématographique de l’Armée Belge / Cinematographic Service of the Belgian Army). This short documentary of less than 19 minutes portrayed the bravery of Belgian soldiers defending, until the end of the war, the last patch of free Belgian territory at the Yser Front. During the interwar years sequences from this film were constantly reused in documentaries and features, sometimes in accordance with the initial intentions of its makers, sometimes totally against them. In terms of cinema history, I will discuss the question of how these recycled pictures have been used in accordance with the intention of their makers, or against it. In terms of theory, I will focus on the question of how far the initial material can determine the meanings of secondary films, which recycle it. The argument will be presented on the examples of two documentaries: A la gloire du troupier belge/ To the Glory of the Belgian Soldier (SCAB, 1922) and Met onze jongens aan de Ijzer / With Our Boys at the Yser (Clemens De Landtsheer, 1928-1929), as well as two feature films: La petite martyre belge / The little Belgian Martyr (Martin, 1928) and its voiced remake La Tragédie de Marchienne / The Tragedy of Marchienne (Martin, 1937). By looking closely at the four films, made by recycled material from La bataille de l’Yser and other original war documentaries, I will try to show different approaches to this visual material, which in peacetime served different, sometimes contradictory political and social purposes, and formed an important part of the Belgian national debate. To illustrate different types of palimpsestic use of the war documentaries I will refer to the concept of palimpsest by Gérard Genette and the concept of bricolage, as defined by Claude Lévy-Strauss. These structuralist concepts, also used in film studies, will help to understand how the heterogeneous pictorial material of mixed origin, used for different, sometimes opposing purposes, formed a visual basis for national mythology needed in interwar Belgium, a country that was insecure about its international status, and torn apart by internal conflicts between the Flemish and the Walloon populations. La bataille de l’Yser, the starting point of my further comparisons, is remembered as one of the eldest Belgian films, and probably the eldest Belgian war documentary. It was made by the already mentioned SCAB, a cinematic unit of the Belgian Army, formed in 1916, and staffed mostly by film amateurs. Historically, the material shot by the SCAB is of unique value, as it focuses on the most glorious episode of Belgian participation in WWI. Although the SCAB lacked experience, and was only allowed to work in a relatively small area near the static front on the Yser, the team managed to deliver some iconic pictures that would live many new lives in later productions. The area of the Yser Front was of great importance for Belgian propaganda. It was the place where, in the autumn of 1914, the Belgian Army succeeded in stopping a German offensive called “The Race to the Sea,” and keeping a small portion of free Belgian territory between the Yser river and the North Sea–for four long years. The Yser Front, apart from its military and political meaning, became a symbolic site of Belgian war effort, and also of conflicting Belgian identities. The Kingdom of Belgium is populated in the northern part by the Dutch-speaking Flemish population, and by the French speaking Walloons in the South. Belgium became an independent state in 1838, and since then the governmental, administrative and military structures had used only French language. Although Flemish intellectuals were striving to achieve equal rights and privileges for the Dutch speakers, at the eve of WWI the Dutch-speakers were factually excluded from government positions. Apparently, at that time it was difficult to define a common Belgian identity that would appeal to the two conflicted groups. The German invasion strengthened patriotic feelings and the sense of unity, but it did not save the divided nation from internal conflicts, which sprang from the unequal status of Flemish and Walloon populations. Importantly, most of the rank-and-file soldiers were of Flemish origin, while the majority of officers represented the Francophone Walloon population. The Flemish soldiers believed strongly that their military effort would help the Flemish population to gain equal rights with the Walloons. After the war, when their situation not only did not improve, but actually deteriorated because some Flemish activists had openly collaborated with the Germans, the Yser Front became a symbolic site of Flemish martyrdom and political injustice. La bataille de l’Yser is an important film not only because it immortalizes the illustrious defence of the Yser Front, but also because it is the longest original Belgian documentary from WWI, as most of the original SCAB material was lost; it was probably destroyed by aerial bombardment in 1940. The catalogue of the OPB (Office de Propagande Belge / Office of Belgian Propaganda) mentions about 124.000 meters of film, divided into 1637 titles, made by the SCAB in 1917 and 1918. This impressive amount of titles is somehow misleading, as they were merely very short pieces of documentary material, meant to be further pasted into newsreels or larger documentaries. 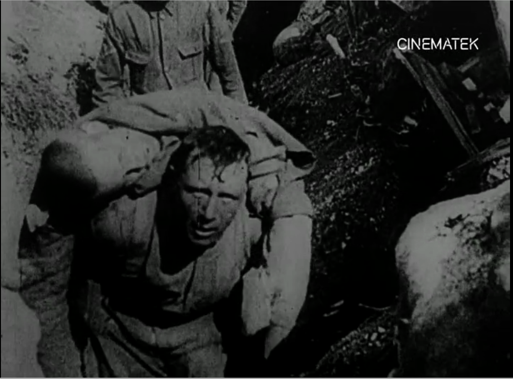 Today, the original SCAB wartime material exists almost entirely as incorporated fragments in documentaries and features which recycled older footage in the interwar period. La bataille de l’Yser is a good example of limitations faced by the SCAB team in their coverage work. 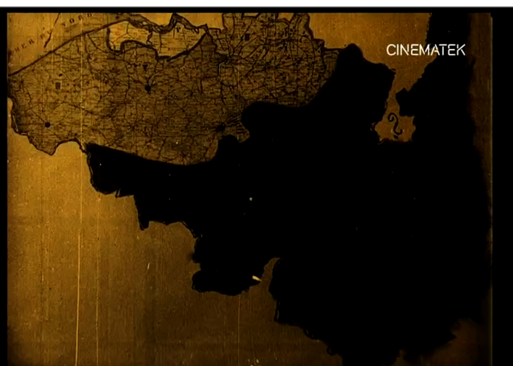 The film consists mostly of photos, animated maps and intertitles, explaining military movements and the overall situation in occupied Belgium. The documentary sequences amount to about 25 percent of the screening time. 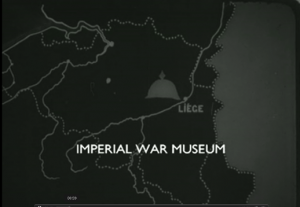 The film opens with intertitles describing the retreat of Belgian Army in August and September of 1914, and the concentration of the army on the Yser at the beginning of October. The concentration is shown by means of an animated map. Then comes the information about “our injured, decimated, almost despairing army” reaching the Yser, without losing a single cannon, followed by documentary footage of troops marching through Veurne, a city in the Yser area, where Belgian headquarters were located. Pic. 1. The Belgian troops in Veurne. From La bataille de l’Yser. 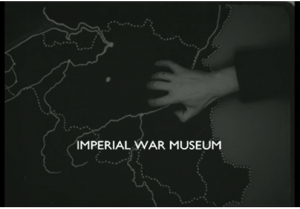 The four phases of the campaign on the Yser are illustrated with animated maps and documentary shots from the front area. 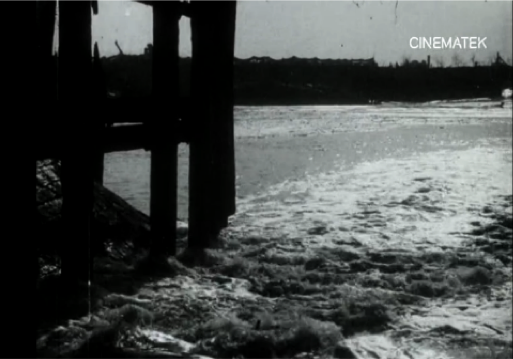 The most dramatic sequence in the film is the flooding of the Nieuwpoort area. By opening sluices in drainage canals, the Belgians managed to stop Germans on the other shore of the Yser and to keep them there until the offensive in 1918. This was the first time during WWI when German armies were stopped. Although the victory was achieved by non-military means, it was presented as a great triumph of Belgian army. La bataille de l’Yser shows the damaged sluices and the flooded landscape. Pic. 2. The flooding of Nieuwpoort area from La bataille de l’Yser. These pictures, along with the shoots of Belgian army marching through Veurne, became iconic and reappeared in many later films. Subsequent intertitles inform about the German panic and retreat, shown on the animated maps. The documentary ends with the anticipation of victory, by quoting from an unidentified, presumably French, newsreel showing a victory parade passing the Arc de Triomphe in Paris, as a promise of future Allied triumph in the war. The flooding sequence became palimpsestic due to its canonical function in Belgian national imagery. In the following two examples I will show how the sequence functioned in two documentaries. The first one, A la gloire du troupier belge (1922), was evoking the sense of Belgian heroism and military glory and propagating the picture of a homogeneous nation, united in struggle against the enemy. The second one, Met onze jongens aan de IJzer / With Our Boys at the Yser (Clemens De Landtsheer, 1928-1929), citing both the original SCAB documentary La bataille de l’Yser, and the footage from the 1922 A la gloire du troupier belge, was made to support and justify the Flemish movement, a separationist tendency within the Belgian unitary state. By questioning the sense of Flemish bloodshed, the documentary operated with the well-known pictures in a different context, and was travestying the earlier films for a more recent political purpose. A la gloire du troupier belge/ To the Glory of the Belgian Soldier, made by the SCAB team in 1922, was a five-part documentary showing the Belgian war effort from the mobilisation until the end of the war and included foreign material and acting sequences. 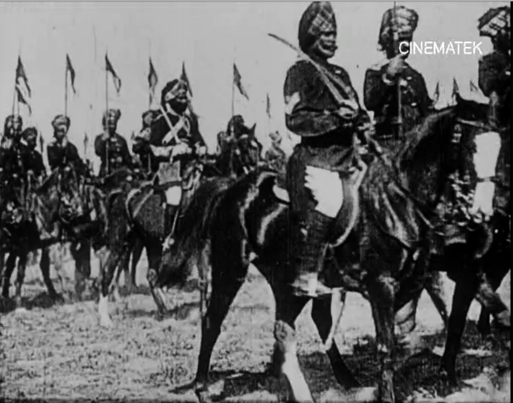 The film opened and closed with a fictional story of a young soldier, leaving his mother to join the army and coming back alive and telling the story of the heroic death of a neighbour’s son. This story of an individual fate set a framework for the larger national story of common effort and triumph over the enemy. Pic. 3. The staged final reunion scene from A la gloire du troupier belge. The heterogeneous film, combining animation, acting, and footage from Belgian, Allied and German war documentaries was a good example of bricolage, that is, “of molding different ingredients into a new form.” At that stage of film history, according to Nanna Verhoeff, bricolage was crucial for the development of longer films and the creation of new film genres. 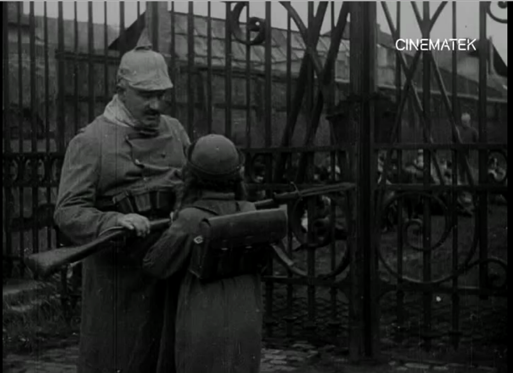 In 1922, A la gloire du troupier belge was the longest Belgian documentary ever made, and therefore a milestone in developing the Belgian narrative about WWI. For the purposes of Belgian internal politics the film was spreading a picture of a homogeneous Belgian army, and avoided any form of distinguishing between Flemish and Walloon soldiers. The intertitles appeared in both languages, French and Dutch, so that both populations, the Walloon and the Flemish, could be addressed as one nation. The German invasion was pictured in a partly acted, partly animated sequence of an anonymous hand, reaching from German territory deep into Belgium, and a symbol of a spiked helmet set over the city of Liege and marking Belgium’s great defeat. German progress was depicted on the map with change of colour, so that the small area on the other side of the Yser was easily recognizable by remaining dark, while the rest of the country went brighter, as if incorporated in the territory of the German Empire. Pic. 4 and 5. Symbolic sequences from A la gloire du troupier belge. This rather unsophisticated sequence is worth mentioning, as it is a good example of palimpsest. The sequence creatively compiles two ideas presented in an earlier feature, La Libre Belgique / Free Belgium (Armand Du Plessy, 1920-1921), telling a thrilling story of collaborators of an authentic Belgian independent newspaper, published and distributed secretly under the German occupation. La Libre Belgique was a hybrid film, combining footage from Allied and German newsreels, British propaganda cartoons, and staged scenes. One of the ways of showing the German invasion was a picture of Belgian territory changing colour and being incorporated into Germany, followed by scenes from German newsreels. The second one was taken directly from the propaganda cartoon Britain’s Effort (Lancelot Speed, 1918) with a staged scene of an anonymous German soldier wearing a spiked helmet, reaching with both his hands over Belgium’s territory and incorporating it into Germany. The scene, which in La Libre Belgique was pasted from the British film, was transposed into the SCAB documentary and became a palimpsest of higher degree by recalling the Belgian feature and the British cartoon at the same time. Pic. 6. Original scene from La Libre Belgique. Pic. 7. Scene from Britain’s effort, incorporated into La Libre Belgique. A German documentary, showing the advance of German infantry and cavalry, used in A la gloire du troupier belge to illustrate the fall of Liege, served another important purpose. By including this piece of enemy propaganda, Belgian production disarmed the piece of German newsreel, and used it against its original meaning. Originally intended to serve t as proof of German supremacy over Belgium, it had been re-used as a testimony of a final Belgian triumph, extending into the area of pictorial memory, and giving the winner the right to re-shape it according to their needs and wishes. Pic. 8. 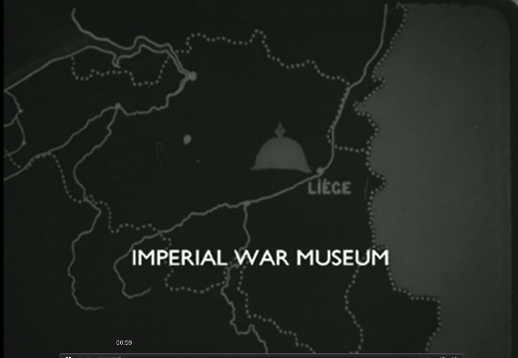 A German newsreel used in A la gloire du troupier belge. A la gloire du troupier belge was the first Belgian documentary combining SCAB’s own material with foreign newsreels, without differentiating or marking the quotes. An earlier example was a feature film, La Libre Belgique. The wide use of bricolage, using fragments of documentaries, photos, letters, staged scenes, scenes from foreign propaganda films, prepared ground for the practice of using sources against their original intention and purpose. Initially the practice was limited to the use of German newsreels in A la gloire du troupier belge. A few years later, however, the SCAB documentary footage, derived from films that affirmed Belgian unity in battle and neglected the issue of Flemish soldiers, had been reused in a strongly propagandist picture serving the Flemish cause. A la gloire du troupier belge, a hybrid documentary, quoted from La Bataille de l’Yser, setting the well-known pictures in a wider national context and prolonging their life within collective memory. This SCAB documentary, glorifying Belgium’s war effort and the heroism of Belgian soldiers, had served as a palimpsest for another documentary, made by Clemens De Landtsheer, a Flemish activist who questioned the loyalty of the Belgian state to its Flemish citizens. De Landstheer was representative of a larger movement, claiming equal rights for the citizens of Flanders, the Dutch-speaking part of Belgium. In remembering the war, it was widely believed that there were more casualties among the Flemish soldiers than among the Walloons, and that all the commanding postings were supposedly given to French-speaking officers, recruited from the Walloon part of the country. During the wartime occupation, Flemish Belgians were subject to intense German propaganda appealing to their supposed sense of Germanic origin. However, the Belgian king Albert I was also trying to win the Flemish over by promising them equal treatment. None of the promises were fulfilled after the war, and the Flemish Movement, a fiercely nationalist organisation, assumed an increasingly separatist agenda. The war effort, seen from this ideological position, was pointless, and the hard won freedom only led to bitter disappointment and injustice. De Landtsheer’s film, circulating beyond the official cinema circuit, became an important statement in the Flemish cause. 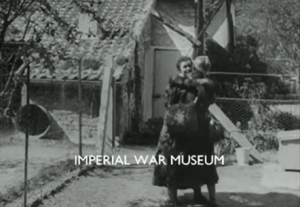 The documentary, based on Belgian and French material which De Landstheer purchased from the SCAB and studied thoroughly, can be seen as another example of bricolage, combining Belgian and foreign newsreel footage with some added acting scenes. The film, described as “highly subversive, unintentionally parodist”  in its citations from A la gloire du troupier belge and other sources, provides a perfect example of palimpsest as travesty and persiflage. 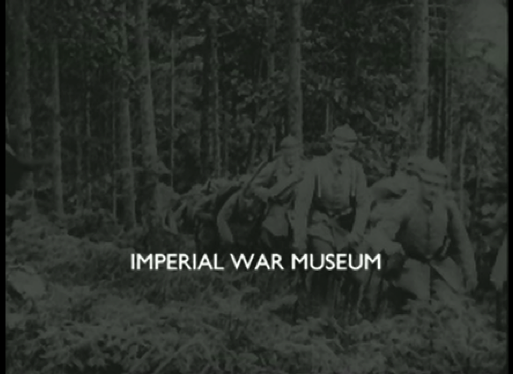 The filmmaker’s statement in the opening titles reads: “This film is made of genuine undoctored material and film shot in the trenches of Yser. Not one image was tampered with. Everything you will see is an original war document taken from actuality.” However, already in the first minutes it quotes from the acted sequence of the soldier’s farewell in A la gloire du troupier belge. This frame device, known from the earlier film, is being distorted and destroyed by the final sequence. 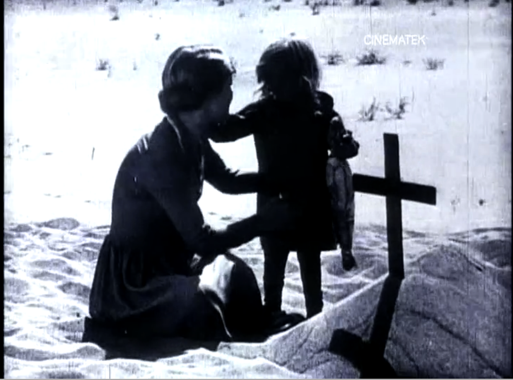 Instead of the soldier’s return, the film ends with a picture of a young widow mourning at an anonymous grave in no-man’s land, consoled by a child. Pic. 9. Staged final scene from Met onze jongens aan de IJzer. This last sequence, playing at the ambiguity of despair and hope, is followed by the closing picture of the IJzertoren / Yser tower, a colossal monument erected to commemorate the fallen Flemish countrymen. The pilgrimage to this symbolic place, co-organized yearly by De Landtsheer, was an important event, unifying Flemish combatants. In De Landtsheer’s documentary the IJzertoren appears as the last future hope for the Flemish cause. The way De Landtsheer manipulates the sources deserves detailed scrutiny. 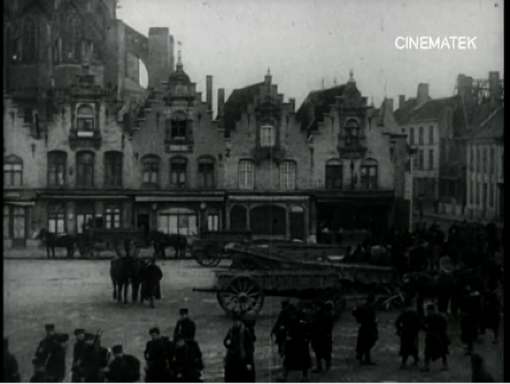 He added new complexity to Belgian national film imagery by using sequences from the Nieuwpoort and Veurne documentaries, which already had an iconic status, and the well-known opening scene from of A la gloire du troupier belge as well as other archival material used in this documentary of Belgian national history. De Landtsheer tells the story of “our” Flemish boys, betrayed by the Belgian state, using the pictures reserved, until then, for the great unifying national narrative. In this sense, his use of canonized pictures of national history is highly subversive as it questions the value of the Flemish sacrifice and problematizes the Belgian victory, which had been bought, in his view, with Flemish blood. The comparison of A la gloire du troupier belge and Met onze jongens aan de IJzer clearly shows that the same footage, which consisted of fragments from La bataille de l’Yser, and sequences from mostly French, sometimes British and German newsreels and propaganda films, could be used for totally different purposes. Both films are telling the story of a heroic fight against the mighty and cruel enemy, and yet, while the SCAB’s documentary affirms Belgium as a homogeneous entity, participating in the Entente victory as an equal partner of the Allies, the De Landtsheer film deals with internal Belgian issues and goes as far as questioning the sense of the struggle against the German invader, and requiring an immediate compensation to soldiers from their own Belgian government. In the following sections I will take a look at the second life of documentaries, both Belgian and foreign ones, in the interwar feature films. I have deliberately decided to focus on two films, which are variants of the same story, and which make a similarly free use of war documentary material. Unlike De Landtsheer’s film, they focus on the Walloon community and its wartime heroism, which is typical for the entire interwar film production. While the first film (1928) was summarizing Belgian sufferings during WWI, the second one (1937) hinted indirectly at the imminent danger of future war: La petite martyre belge / The Little Belgian Martyr (Francis Martin, 1928) and its voiced remake La tragédie de Marchienne / The Tragedy of Marchienne (Francis Martin, 1937). La petite martyre belge is a hybrid film, combining acting scenes with newsreel footage. The tragic story of Yvonne Vieslet, a ten-year-old Walloon girl shot accidentally by a German soldier while trying to give some food to French captives, was used in both cases as a framing device for a patriotic film, portraying the individual sacrifice as part of the national war effort. Pict. 10. German soldier threatening Yvonne, La tragédie de Marchienne. While the original production from 1928 uses the acting scenes as a proper framework, opening and closing a long documentary section, the 1937 remake combines documentary war footage with scenes from Yvonne’s life and a fictional story of a young Belgian woman helping French soldiers by hiding them from Germans. The original material in the first film takes about half of the screening time, and the story of Yvonne is reduced to commonly known facts. La petite martyre belge mostly cites newsreels, combining material of various origins, which is sometimes astonishingly or comically incongruent. Along with the essential images of Nieuwpoort and Veurne, it shows, for instance, shots of French and British colonial troops charging (separately) through unspecified landscapes to rescue Belgium. Pic. 11 and 12. Colonial troops appearing in La petite martyre belge. This somewhat awkward combination of global and local elements can be interpreted as an attempt to integrate the story of a little Belgian martyr into the general history of WWI, or as a reminder of the Belgian share in the victory. While re-cycling the popular image of innocent Belgian suffering, the film accentuates the redemptive aspect of martyrdom and death. The religious metaphor, suggested in the earliest documentaries, is permanently present in La petite martyre belge. The girl is presented as a modern saint, her emblem is a white lily that bleeds after her death. Her readiness to share her bread with a starving French captive, enables her to give her life away for his sake. In the original version Yvonne’s death remains unpunished, while in the 1937 remake it causes a rebellion among the POWs and, after a questioning by a German officer, leads to the execution of the German soldier who shot and killed her. The former film belongs to an earlier stage of Belgian productions with an uncompromising image of German oppressors, while the latter represents a subsequent, openly reconciliatory tendency towards Germany, a result of Belgian acceptance of the pacifist turn in international politics and the sensibility of German diplomats towards critical pictures of their countrymen. “The war films of the late 1930s were paradoxical in nature: on the surface, they seemed to point to cultural demobilization, but on a deeper level they testified to intensify political tension and remobilization of war culture”. In La tragédie de Marchienne this deeper level is constructed by archival features, reaching from typical Belgian war pictures to valuable and well known shots from foreign films. Among other sources, the film quotes from American newsreels showing global mobilisation, and features the most famous images from The Battle of the Somme (Charles Urban and Geoffrey Malins, 1916), including the ‘going over the top’ sequence, as well as the sinking of a cruiser, taken, most probably, from the American feature The Little American (Cecil DeMille, 1917). Pic. 13. The legendary shot from Battle of the Somme, reused in La tragédie de Marchienne. The selection of ideologically powerful pictures sends a clear signal to the audience. While watching a melodrama telling the story of Yvonne, and the story of the soldier she was trying to help (who was married to a Belgian woman and wanted to name his child after Yvonne), the audience also watched documentary images of the most brutal moments of war. The intertextual layers made of war footage were thus undermining the reconciliatory message of the feature film. The audience was actually watching two films of contrary meanings and was invited to make its own choices. La tragédie de Marchienne is a good summary of the development of Belgian historical cinema in the interwar period, with its the subversive potential discovered and used frequently by Belgian bricoleurs, combining different genres, documents of different origin, and playing skilfully with commonly shared images of war. Using the potential of collective memory, they were repetitively creating and re-creating the First World War. This narrative strategy enabled them to illustrate subversive, controversial ideas with well-known images, considered as common heritage. The 1.637 titles, made by the SCAB during the First World War and burnt during the Second, are now accessible only through other films, but even in the interwar period they could not be seen separate from the historical, political and sociological context of their many re-cycled lives. This seems paradigmatic for the functioning of original, ‘real’ pictures of historical events in general. Most of such images have been recycled so many times and loaded with so many additional meanings, that they now exist more as palimpsests than as originals. 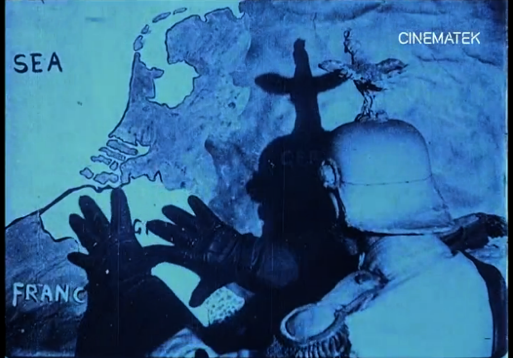 The Belgian war footage, in its ghostly existence within other films, functions within the network of permanently changing culture and is still part of recent debates. The permanent recycling of Belgian war documentaries demonstrates a wider problem: the factual non-existence of an image without an ideological narrative frame. The urge to reuse and recreate well-known heroic images seems also characteristic for a society in need of common lieux de memoire, mnemonic pictures, translating the traumatic war experience into commonly accepted and understandable visual imagery, which, in the process of bricolage, could be applied to various, contradicting narratives, and which could be charged with constantly changing meanings. For the key definitions see: Gérard Genette. Palimpsests: Literature in the Second Degree. (Lincoln: University of Nebraska Press, 1997) and Claude Levi-Strauss, The Savage Mind. (Letchworth: The Garden City Press Ltd, 1966). For an elaboration on the position of palimpsest see: Bruno de Weever, “Prologue: Historical Film as Palimpsest” in Perspectives on European Film and History, ed. Leen Engelen, Roel Vande Winkel, (Gent: Academia Press, 2007), 5-11.; Gordon E. Slethaug, “Palimpsest and Bricolage: Playful and Serious Citations in Broken flowers and Snow White’s offspring”, in Adaptation Theory and Criticism: Postmodern Literature and Cinema in the USA, (London: Bloomsbury Publishing, 2014), 191-246. For a general history of Belgium in WWI see: Sophie De Schaepdrijver, The Great War. The Kingdom of Belgium during the First World War (Amsterdam: Atlas, 1997). For the Yser Front see: Paul van Pul, In Flanders’ Flooded Fields: Before Ypres there was Yser. (Barnsley: Pen & Sword Military, 2006). Rochet, “Plongée au coeur …”, 112. For history and meaning of the Flemish Movement see: Karen Shelby, Flemish Nationalism and the Great War: The Politics of Memory, Visual Culture and Commemoration (Basingstoke: Palgrave Macmillan, 2012). 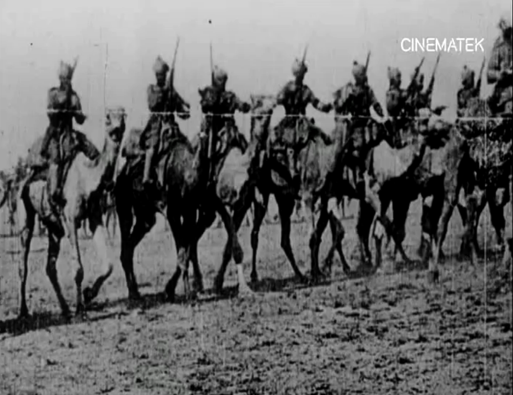 Nanna Verhoeff, The West in Early Cinema: After the Beginning. (Amsterdam: Amsterdam University Press, 2006), 184; see also Miriam Hansen, Babel and Babylon: Spectatorship in American Silent Film (Cambridge MA: Harvard University Press, 1994), 29, 48-49. For the usage of the figure of “poor little Belgium” see: Bernhard Liemann, “Transformation of Local Public Spheres: German, Belgian and Dutch Border Towns during the First World War Compared”, in Other Fronts, Other Wars? : First World War Studies on the Eve of the Centennial, eds. Joachim Bürgschwentner, Matthias Egger, Gunda Barth-Scalmani, (Leiden: Brill), 349-369. Directly after the armistice Belgium hoped for some territorial gains and financial contributions. These hopes had not been fulfilled. Rochet, “Plongée au coeur …”, 121. Heather Jones, Violence against Prisoners of War in the First World War: Britain, France and Germany, 1914–1920. (Cambridge: Cambridge University Press, 2013), 206. Natalia Stachura (MA Dutch and German Studies, PhD in South African Studies) is researcher at the Adam Mickiewicz University (AMU) in Poznań. In the framework of the HERA project Cultural exchange in a time of global conflict: Colonials, Neutrals and Belligerents during the First World War (CEGC), she is writing a monograph about film propaganda in the Netherlands. Amara, Michël, “Une icône… des propagandes – Au coeur du conflit – Les grands défis de la propagande belge durant la Première Guerre mondiale”, in La petite Belgique dans la Grande Guerre : une icône, des images: actes du colloque de Namur, 24, 25, 26 et 27 novembre 2010, Facultés universitaires Notre-Dame de la Paix, ed. Bénédicte Rochet, Axel Tixhon, 21-35. Namur: Presses Universitaires de Namur, 2012. Best, Brian. Reporting from the Front: War Reporters during the Great War. Barnsley: Pen and Sword, 2014. Engelen, Leen. “Film/Cinema (Belgium)”, in 1914-1918-online. International Encyclopedia of the First World War, ed. Ute Daniel, Peter Gatrell, Oliver Janz, Heather Jones, Jennifer Keene, Alan Kramer, and Bill Nasson, issued by Freie Universität Berlin, Berlin 2014-10-08. Accessed 3 February 2015. http://dx.doi.org/10.15463/ie1418.10320. —–. “Cinematic Representations of the Enemy in Belgian Silent Fiction Films”, Warfare and Belligerence. Perspectives in First World War Studies, ed. P. Purseigle, 359-378. Boston: Brill Academic Publishers, 2005. Genette, Gérard. Palimpsests: Literature in the Second Degree. Lincoln: University of Nebraska Press, 1997. Hansen, Miriam. Babel and Babylon: Spectatorship in American Silent Film. Cambridge MA: Harvard University Press, 1994. Jones, Heather. Violence against Prisoners of War in the First World War: Britain, France and Germany, 1914–1920. Cambridge: Cambridge University Press, 2013. Lévi-Strauss, Claude. The Savage Mind. Letchworth: The Garden City Press Ltd, 1966. Liemann, Bernhard. “Transformation of Local Public Spheres: German, Belgian and Dutch Border Towns during the First World War Compared”, in Other Fronts, Other Wars? : First World War Studies on the Eve of the Centennial, eds. Joachim Bürgschwentner, Matthias Egger, and Gunda Barth-Scalmani, 349-369. Leiden: Brill, 2014. Rochet, Bénédicte. “Plongée au coeur des prises de vues du service cinématographique de l’armée belge : un matériel visuel de la Grande Guerre à multiples usages”, in La petite Belgique dans la Grande Guerre : une icône, des images: actes du colloque de Namur, 24, 25, 26 et 27 novembre 2010, Facultés universitaires Notre-Dame de la Paix, ed. Bénédicte Rochet and Axel Tixhon, 111-125. Namur: Presses Universitaires de Namur, 2012. Slethaug, Gordon E. “Palimpsest and Bricolage: Playful and Serious Citations in Broken Flowers and Snow White’s Offspring”, Adaptation Theory and Criticism: Postmodern Literature and Cinema in the USA, Gordon E. Slethaug, 191-246. London: Bloomsbury Publishing, 2014. Verhoeff, Nanna. 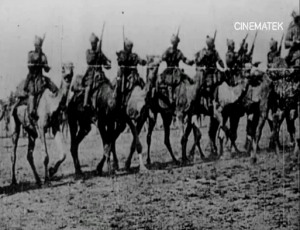 The West in Early Cinema: After the Beginning. Amsterdam: Amsterdam University Press, 2006. Weever, Bruno de. “Prologue: Historical Film as Palimpsest”, in Perspectives on European Film and History, ed. Leen Engelen and Roel Vande Winkel, 5-11. Gent: Academia Press. 2007. La Bataille de l’Yser (SCAB, <1918). The Battle of the Somme (Charles Urban and Geoffrey Malins, 1916). Britain’s Effort (Lancelot Speed, 1918). A la gloire du troupier belge (SCAB, 1922). La Libre Belgique (Armand Du Plessy, 1920-1921). The Little American (Cecil B. DeMille, 1917). Met onze jongens aan de IJzer (Clemens De Landtsheer, 1928-1929). La petite martyre belge (Francis Martin, 1928). La tragédie de Marchienne (Francis Martin, 1937).